As of Thursday we are no longer under a boil order or curfew. There are not as many checkpoints at intersections. We were having to show our ID's to enter town but that has not happened since Thursday. Power was restored in many areas. I believe only the hardest hit areas are still without. The traffic signal at Rt 24 and N Main is now operating. The fields around the church are slowly being cleaned up by incredible volunteers. These fields were heavily littered with debris. There are piles of debris lined up along the church's drive. They keep getting bigger. Still, there is so much clean up to do. I worked at the church in the morning starting about 8:30 AM. We are tapering off the hot meals that were served from early morning to about 7 PM. We are transitioning to one big meal daily until Thanksgiving. On Thanksgiving our church hosts a Community Thanksgiving Meal each year. Normally there are 155 served. This year we are expecting 500 to 700. That is a big jump in numbers but we have been offered assistance from food services so some of the food will be prepared elsewhere. Yesterday, Jim Linsley, of Lindy's Downtown Market, came by to talk to Nikki. Jim offered to arrange for temperature storage of the turkeys and also offered to donate many turkeys. This took a big load off of Nikki and she cried tears of relief and joy. Around noon our team of Angels arrived. These wonderful guys are part of the disaster team that Mary is part of. I can't remember the name of this group at the moment but will get it. 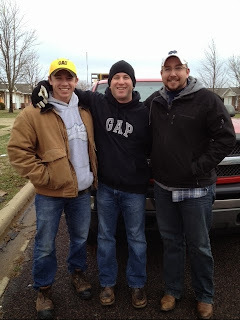 They followed us to Alice's house and helped us retrieve some pieces of furniture that were not damaged. Then they hauled these to her new place. She cannot move in to her place until they get licensed. What a blessing that a new senior living facility was opening at this time! These photos were taken on Tuesday. It actually looked worse yesterday after two days of rain. Everything was soggy and water was coming through the walls. The front door was jammed halfway open. Greg said we should not touch the front door as it was holding up the front of the house. I went back to the church about 2:00 PM. There didn't seem to be a lot to do so I left about 3:00 PM to pick up my mother in law's mail at the post office and do some banking. It was a light moment at the post office when they asked me for the name and address. I told them her address and the woman said, "Oh, we are now delivering mail there." I said, "I don't know how you could as she does not have a mailbox or a house." Traffic was slow going back to the church. As I was creeping along Main St my body suddenly crashed. I just felt I had to get home. I wasn't sure how much there was to do at Crossroads so I just passed the church drive and went home. I knew if I went to Crossroads I would get caught in traffic again. I can't remember having heavy traffic in Washington. Your postings and photos are doing so much to help put a human face on the disaster. It is heartwarming to hear of such generous effort being put forth to create a celebration of thanks in the midst of so much destruction. I hope you had a good rest. Take care. 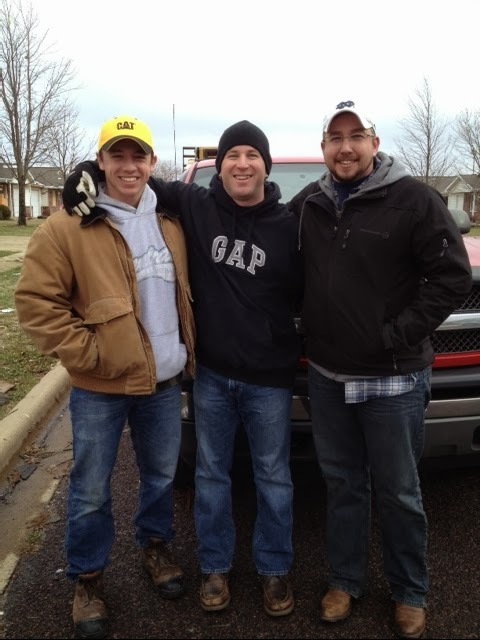 Thank you for chronicling the post-Tornado clean-up activities of so many working together. The details and pictures you provide are so helpful. With the news so often reporting the evil, the greed and the apathy in this world, it does my heart good to see kindness. I hope you were able to achieve a long, restorative sleep. The personal news from you and the pictures are so helpful. Whatever I try to write sounds so lame and shallow - so I'll just say that you and your community continue to be on my mind and in my prayers. After last month, I feel a part of Washington.